Carrie Bradshaw- "So Louise from St. Louis, I just have one more question." Carrie Bradshaw-"How does an unemployed girl with three roommates afford the Patchwork Denim Bowley Louis Vuitton bag?" Louise-"It's rented. Bag Borrow or Steal? It's like Netflix for purses." At that point every girl thought "I can rent a Louis Vuitton handbag??!!" and flocked to Bag Borrow or Steal to rent their own luxury designer handbag. For years I always stocked the site but never fully joined because you had to pay a hefty membership fee. Well times have changed with Bag Borrow or Steal and the membership fee is no more, and the hefty shipping price is gone and free shipping is in place. When Bag Borrow or Steal offered me a credit to their site to try the service out I accepted without hesitation. This is where the hunt began. I stocked their site daily, favorited numerous bags, waited and waited for bags to be available, added bags to my cart but never check out till one day I saw on BBS twitter feed that they were offering 40% rental fees. And like that my decisions were made, the submit button was hit, and the bags were on their way. I do have to say I was being a shopping diva and needed 3 bags so I paid a little out of pocket on my own. That Tuesday afternoon Marc, Chloe, and Burberry arrived at my door and I was so ecstatic to open it up. Wednesday morning as I walked across campus to my office it was such a weird surreal feeling to know that I had a $1900 purse on my arm. I was scared I was going to get hijacked but knew no one in this area would truly know handbags like I do. I have to say I’m a little sad today knowing that my Burberry is packaged up and waiting to go back home. That week went too quickly and I was just starting to know you! Incase you didn’t know you can rent bags from BBS for 1 week, 1 month, or quartlery-3 months. Chloe and Marc are with me till the end of the month and I know I will shed a tear when they too have to depart for their next adventure. But it’s fun to have a bag for a short while without the full commitment of paying the huge price. Also, when I move on to the next bag I don’t feel so bad since I don’t have a $1900 purse just lying in my closet not being used. I highly recommend Bag Borrow or Steal. Their customer service is super friendly and helpful, the shipping is free, quick, easy, and painless, the bags are gorgeous, dirt free, and look brand new. The only down side is waiting for the bag you want if you have a specific one in mind. Bag Borrow or Steal is going to be perfect for the next event I go to and want a fun new bag, clutch, or jewelry for a few days. I want to know what you think about Bag Borrow or Steal so please share and tell me. Disclosure: Bag Borrow or Steal gave me a gift credit to try their site and service. I was not paid for this post and all opinions expressed here are my own. You are so right and you caught me...bare arms and all :) I usually never wear sleeveless tops but I thought minimal clothing was the best option for these photos. And this is a great service! 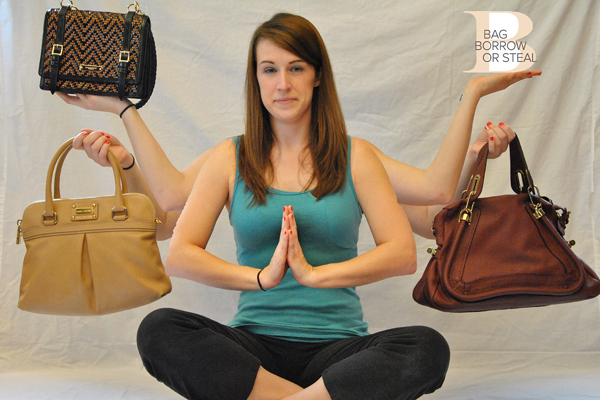 Great post, we're glad you enjoyed the Chloe, Burberry and Marc by Marc Jacobs from Bag Borrow or Steal! great post! i love this pic too!! ahahahahah....LOVE the pic! so creative! i would LOVE to try their service!!! how fun! thanks for sharing girl.